"One Storm" provides protection against losses caused by typhoons in Vietnam. 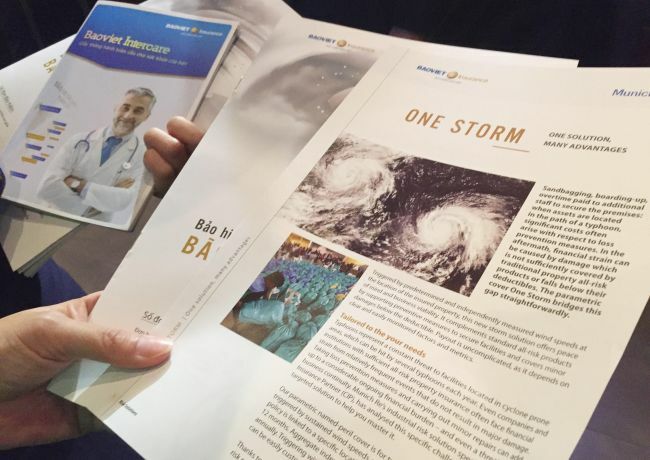 The Bao Viet Insurance Corporation (Bao Viet Insurance) and the Munich Reinsurance Company (Munich Re) officially launched their new “One Storm” insurance product on August 31 in Hanoi, providing protection against losses caused by typhoons. Due to its tropical monsoon climate, Vietnam is in the path of many major storms, which regularly cause devastating losses. Businesses understand the importance of having solutions to protect their assets from unexpected disasters. Whenever a risk such as a tropical storm arises without proper preparation or having a safety solution in place, there may be financial difficulties due to the fact that the damaged property is not adequately protected or below their actual deductible. This new non-traditional insurance solution is a parametric trigger typhoon risk cover, which protects fixed assets in operation or under construction, determined by the exact insured location (latitude, longitude) both onshore and offshore. Unlike a traditional insurance product that only covers a policyholder’s losses following physical damage, “One Storm” handles claims by quickly paying out even without any physical damage incurred. Risk holders can check their pay-out in real time after a storm takes place at onestorm.munichre.com, with data being identified and verified by an independent third party, the Japanese Meteorological Agency (JMA). This specific product targets customers such as organizations, power plant operators, big corporations, industrial enterprises, and government agencies, with a compensation limit from VND10 billion ($440,000) to VND100 billion ($4.4 million) per damaged location. Fixed assets are not only covered under the five storm levels, as clients are also insured for non-material claims including loss of profits due to business interruptions, loss prevention costs, overtime paid, coverage for deductible of traditional property insurance policies, and costs of claim settlement for damage caused by the storm. In addition, the “One Storm” product provides customers with financial support to minimize losses even though no deductible is applied, cover for losses below the deductible of other ordinary insurance claims, and simple and quick compensation procedures to finance investment activities and maintain business activities. “Bao Viet Insurance’s main policy in 2017 is to strengthen its cooperation with reputable international partners in order to provide products and services,” Mr. Nguyen Quang Hung, Deputy CEO of Bao Viet Insurance, told the launch ceremony, adding that “One Storm”, which is a first in Vietnam, brings many favorable options to customers. The launch of “One Storm” is the result of close cooperation between the two partners, mobilizing the strength of each to provide good experience and satisfaction with the product as well as the best quality of service to customers. The cooperation of the Number 1 non-life insurer in Vietnam, Bao Viet Insurance, with global reinsurer Munich Re, promises to provide many solutions to protect customers against the risk of tropical storms in Vietnam.